Category 5 storms are the most dangerous. Hurricane Irma is the most powerful Atlantic hurricane in recorded history. Winds approach 185 MPH, gusts exceed 215 MPH. A force this powerful will devastate any land areas struck. The human toll could be high. Pre-dawn Wednesday, Irma made landfall in the northeastern Caribbean, the full impact still to be felt as this is written. Area officials warned about the coming onslaught. At around 1:47AM, the hurricane’s eye passed over Barbuda. Its forecast trajectory has it heading toward Puerto Rico, the Dominican Republic, Haiti and Cuba before likely moving toward Florida’s east or west coasts by the weekend. Governor Rick Scott declared a state-wide emergency in all Florida counties. The southern most Keys would be first affected. People in coastal areas should prepare to evacuate to inland locations. At 5:00AM Atlantic Standard Time Wednesday, the National Hurricane Center (NHC) called Irma “a potentially catastrophic category 5 hurricane (with) life-threatening wind, storm surge, and rainfall hazards” to areas struck. The NHC said maximum winds are expected to fluctuate between category 4 and 5 strength for the next day or two. Trump declared a state of emergency in Florida, Puerto, and the US Virgin Islands. Florida Governor Scott ordered state officials to suspend highway tolls for thousands preparing to evacuate to safer areas. Lots more than that needs to be done by federal, state and local officials – prioritizing public safety and disaster relief for affected people straightaway after the storm subsides. 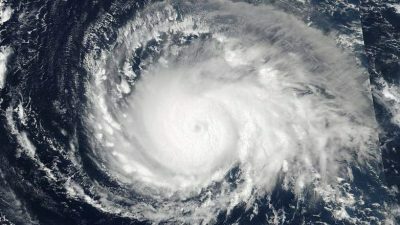 Warm water fuels hurricanes. Irma is moving over waters 1.8 degrees warmer than normal at this time of year, according to meteorologist Jeff Masters. The National Weather Service said Puerto Rico hasn’t seen anything like this since 1928, a storm killing over 2,700 in the island, Guadeloupe and Florida. Miami Beach Mayor Carlos Gimenez said voluntary evacuations could begin as soon as Wednesday evening. The NHC said hurricane-force winds extend 50 miles from Irma’s core, tropical storm-winds up to 175 miles – assuring large areas in and near its path will be affected. NHC’s Eric Blake called satellite images of Irma’s “monster eye one of the most incredible things” he ever saw. Destruction to areas struck is sure to be devastating if current wind speeds maintain anything close to their current force. Most critical is loss of human lives – likely far exceeding the toll from Hurricane Harvey.